Senior first baseman Tori Vidales was clutch when her team needed her most. 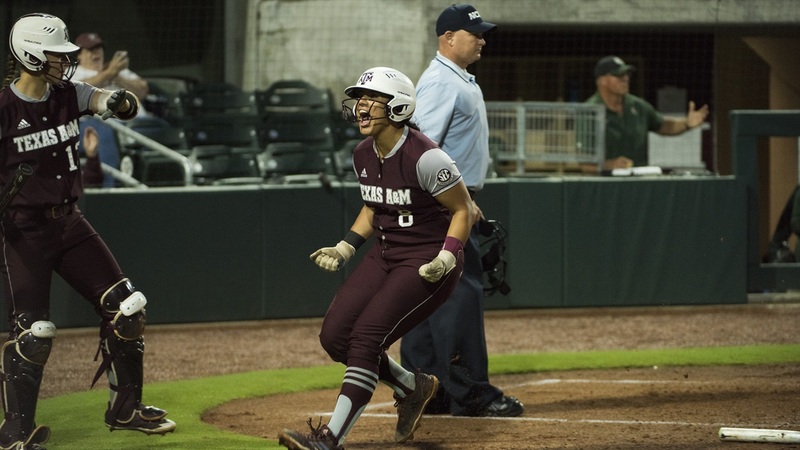 She kept the Aggie softball team’s season alive by cranking a three-run shot to center field, ultimately pushing A&M to a 5-4 victory over Florida in game two of the Gainesville Super Regional. A&M (44-17) wasted no time putting a run on the board. In the bottom of the first inning, Sarah Hudek crushed a ball over the wall in center field for the Aggies' first run. The Aggies struck again just an inning later. After Ashley Walters lead the inning off with a double, Kristen Cuyos drove pinch runner Kylie George home on a fielder’s choice. Florida third baseman Nicole DeWitt made a wild throw on a ground-out from Cuyos, allowing George to race home. The Gators tied the game up at two runs apiece in top of the third. After they put two runners on via a walk and a single, Janell Wheaton hit a liner to third that Riley Sartain couldn’t grab, driving in two runs. Florida took the lead in the top of the fourth. The Gators put two in scoring position before Janell DeWitt delivered a two-run RBI-single to right field to put the Gators up, 4-2. Trinity Harrington was in the circle for the second straight game for Texas A&M and tossed three and a third innings, surrendering six hits and four runs before being pulled for Payton McBride. McBride (3-0, 1.60 ERA) was flawless in relief, working three and two thirds scoreless innings and pitching her way to a win. McBride was able to work her way around traffic on the base paths with the strikeout, logging four to keep Florida’s hitters off balance. After fumbling last night’s affair, the Aggies have forced a winner-takes-all game three. Look for the Aggies to use a variety of different arms in tomorrow’s game. Samantha Show and Lexi Smith haven’t pitched in the series yet, but odds are they will be called upon tomorrow night. First pitch is set for 4 p.m., and the game can be seen on ESPN. That's about as badass of a response to Game 1's blown save. Has the fla starter been named? I expect Barnhill to pitch.